Projecting an emerging market rebound over the next two years, Bombardier predicted a continuing recovery in the light jet category, as well as resurgent demand for large cabin airplanes, when it unveiled its 10-year market forecast on the opening day of the 2016 European Business Aviation Convention & Exhibition (EBACE2016). In its annual market forecast, Bombardier Business Aircraft predicts up to 8,300 new business jet deliveries representing approximately $250 billion US in industry revenues from 2016 to 2025 in the segments in which it competes. 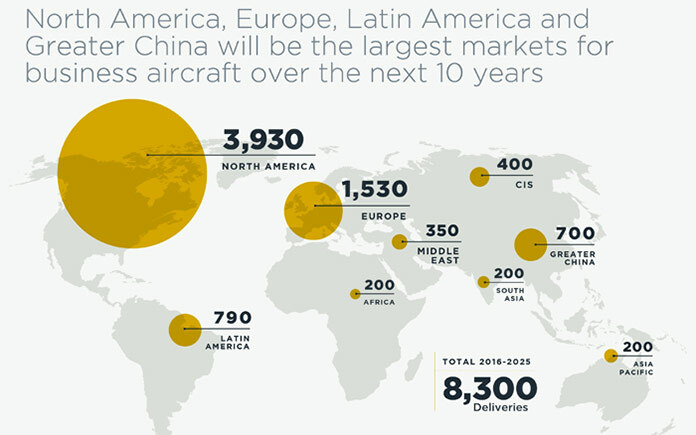 Significant growth is expected in the long term, with larger aircraft continuing to dominate the market. As growth eventually returns in emerging regions, Bombardier is confident the business jet market will pick up as the popularity of private aviation continues to increase every year. This year’s forecast is revised down from last year’s 9,000 aircraft over 10 years, which Gallagher attributed to softer than expected short-term market outlook. A rebound in emerging markets by the end of 2017 should boost global GDP growth to nearly 3 percent, a key tipping point for business aircraft demand, said Gallagher. Over the same 24-month period, a steady, if gradual, rise in the oil price should lift world stock markets. While the light jet category was hit hardest by the 2008 recession, it represents the largest installed fleet, so will see demand generated by aircraft replacement over the next 10 years. Before 2008, light jets represented nearly half of all sales, at more than 400 deliveries a year, said Gallagher. “We expect to see a continuing recovery of the light category, but not to what we saw before 2008.” He anticipated closer to 340 deliveries a year, making up about 37 percent of the future market. Deliveries in the midsize category, which represents a younger fleet of recent successful models, would hold steady in the short and long term. Bombardier Business Aircraft expects North America will account for the greatest number of new business jet deliveries between 2016 and 2025 with 3,930 aircraft, followed by Europe, which remains the second largest market with 1,530 deliveries expected between 2016 and 2025.